This is very cool and now I want to know, “why?”. Websites say “fluctuations in supply and demand” cause these cycles, but that doesn’t explain it fully. Maybe something special happens every 15 days: oil is imported, perhaps? 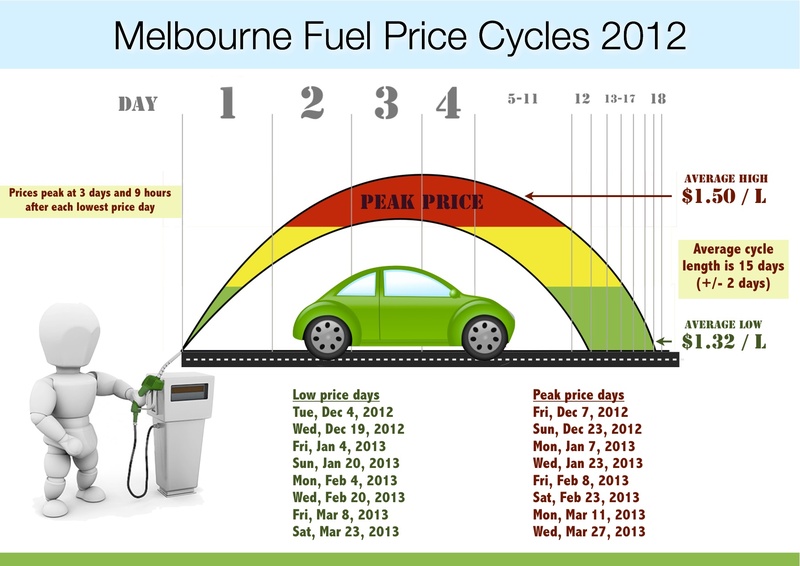 All 5 major Australian cities display similar petrol price cycles. Do petrol prices cycle so predictably in Canada? I don’t know. I will have to look into it. I know there are fluctuations, and it has seemed more cyclical in the last 6 months or so than usual. Generally it just seems to go higher, with a few dips in price along the way. There are price tracking websites, though I don’t normally visit them. I think that if they did fluctuate in similar ways and in phase with Australia that would be interesting and perhaps suggest some global influences. But not delivery since it flows in pipes from the source and ships are not involved, at least in Western Canada. Maybe this is a uniquely Australian phenomenon? I am off to bed, but it occurs to me it would be interest to check out New Zealand as well. I just sent you a typical Melbourne petrol price chart. Basically every month looks like that one, with two peaks and long troughs. I did statistics on 12 months’ worth of data. If I ever find out what causes this, I’ll let you know! Very curious phenomenon – maybe it is deliveries. Or perhaps something just got synced by accident – usage, how long it takes before needing a fill up, combined with delivery or something? Weird. Nice that its predictable though, if you only fill up every two weeks….